Mandy Collins, supposedly dead, awakes in the present as the nineteen-year-old she was in 1970. Dane Collins, distraught from the death of his wife, meets a young magician who performs illusions that even he, a seasoned professional, can’t even explain. The girl, in every way, is identical to the girl he met and married forty years ago. They begin a relationship as mentor and protegee, and soon they are watched by those who possess the answers to Mandy’s powers and have the ability to decide what will become of her. After six years, best-selling author Frank Peretti has brought us his latest novel. And he has returned with a bang. Unlike many of Frank’s other novels, Illusion is not twisted with evil and supernatural thrills; but that doesn’t stop it from being a gripping novel. Frank brought Mandy and Dane to life with ease, letting us enjoy their company. As Mandy found herself in an unknown time era, Frank writes her so well, that her emotions are clear and we sympathize for the young girl. He journey of figuring out who she really is is something that Frank does not take lightly. We feel Mandy’s struggles and her sense of emptiness as she wonders and tries to remember who she is or where she came from. Dane also was a very well-penned character. The surprising attraction to the nineteen-year-old he has does not end up falling flat or end up cheesy. The struggle that he has with facing the girl that is identical to his late wife is very real and pulses from the pages. Of course this novel is about illusionists and, obviously, illusions. With something like this, one has to be very careful to write the illusions into existence to the point that the reader can see the illusion happening in their head. Frank does a wonderful job with this. He makes it fun and exciting. The imagery draws us in as we see Mandy performing illusions that even she cannot possibly explain. 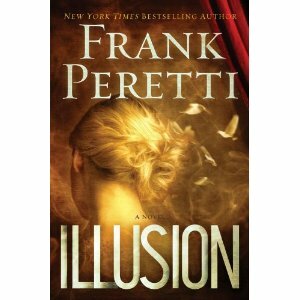 With great characters and amazing imagery and a fantastic story about love and finding oneself, Frank Peretti has crafted a novel that will surely delight readers as a professional illusionist delights his audience. Note: I received a copy of this novel from the publisher for an honest review. All thoughts and opinions are mine.